LifeCare Health Partners has welcomed Haven Home Health to its family of hospitals nationwide, and in 2019, Haven Home Health is now known as LifeCare Home Care, as part of the LifeCare Health Partners family. The same quality of care you have come to expect will continue. The same exceptional care, with a new name. LifeCare Health Partners is dedicated to improving the quality of life for patients and maximizing their potential for healing and recovery. Powered by passionate care teams, it specializes in helping patients with expert, aggressive medical care in a warm, caring environment. LifeCare Health Partners encompasses its family of specialized hospitals, as well as a spectrum of post-acute services including transitional care, inpatient and outpatient behavioral health treatment and home-based care. Care teams meet patients in the most appropriate care setting for their specific needs to advance health, healing and recovery across the care continuum. Headquartered in Plano, Texas, the company was founded in 1992 and quickly grew into a system of more than 15 freestanding and “hospital-in-hospital” facilities nationwide designed to treat chronically ill and medically complex patients. In 2016, the organization expanded to include an even larger post-acute platform of services with the addition of home-based care. In their combined careers, our experienced staff has served over 30,000 patients and has performed over 1,000,000 patient visits. Each member of our staff has earned an impeccable reputation with patients, physicians, the Texas Department of Health, and Medicare. When it comes to our patients, though, we feel that what makes us truly stand out is the plain and simple facts. Compare our results against other agencies! Our outcomes speak for themselves. We strive to excel in patient care. A mandatory state audit in the spring of 2015 resulted in ZERO deficiencies as well as ZERO licensing violations, unusual for a Category 4 agency. The Texas Department of Aging and Disability Services (TDADS) also found zero violations or deficiencies in our 2012, 2013, and 2014 inspections. Compare our scores against other agencies. Our normal office hours are 8:30am to 5:00pm CST, Monday through Friday. An on-call nurse is always available during off hours, and can be reached using the same local office number provided to you during admission. If you're ever not sure which number to call, dial our toll-free number at 866-539-0444. View our list of Frequently Asked Questions to learn more about why LifeCare Home Care might be the right fit for you. Also, you can view our map to see LifeCare Home Care coverage in your area! A Registered Nurse (RN) or Licensed Vocational Nurse (LVN) provides Colostomy Care, Enteral Nutrition/TPN, Medication Management, Medical Management, IV Therapy, Pain Management, Post-Surgical Care and Wound Care. For patients with acute nerve, orthopedic or muscle disorders, a routine program of light exercise or stretching activities is established. The therapy routine is designed to increase movement and mobility. Occupational therapy must be ordered by the physician ONLY along with another skilled service. This therapy helps patients regain fine motor coordination and improve daily living activities such as dressing and feeding. Speech Therapy is provided to improve communication skills for those with impaired ability to use language and speech. Patients recovering from a stroke, head injury or hearing loss may benefit, as well as those having difficulty with chewing and swallowing as a result of an illness, stroke or progressive medical condition. The home health Social Worker may provide counsel to patients and families for long range planning and decision making, and help coordinate services with other community resources and agencies. Services are designed to improve the patients physical, emotional and functional status. 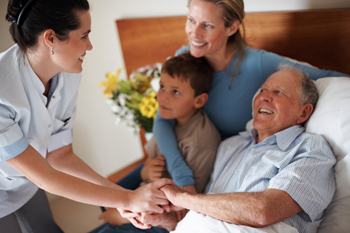 After the level of care is established by a Registered Nurse, the aide may help with bathing and grooming, dressing, walking, transfers from bed to chair. An aide may provide help with some routine services for the patient (such as bed linen changes), or prepare and feed nutritious meals. While the aide is not allowed to administer medicines (this is the job of an RN/LVN), the HHA may provide reminders to take medicines on time. Compare our outcomes in any of these categories against both the state and national benchmarks!